To start our list of Cappadocia travel tips, we want you to prepare for a travel experience unlike anywhere else. Upon first glance, the area appears deserted but with closer inspection and some adventurous exploration, lunar-like plains come into view, and they are unique, mesmerising and unbelievable. The earliest records of life in Cappadocia date from the late 6th century BC as part of the ancient Persian Empire. After their demise, Alexander the Great attempted to rule through his military commanders, but Ariarathes, a Persian aristocrat became the first king. Cappadocia became Turkish in 1071 following the Manzikert Battle between the Byzantine Empire and Seljuk Turks. The Byzantine defeat played a crucial role in gradual Turkification of Anatolia for the Seljuks to establish sole dominance but by the 15th century, the Ottoman empire conquered and ruled the lands. These days, as part of the Turkish Republic, it is visited by 2.5 million tourists a year and a favourite place for proposals and honeymoons. Authentic cave hotels, moon-like valleys and hot-air balloon rides are just a few of many reasons to experience the area for yourself. A favourite time to visit Cappadocia is May when it hosts Turkey’s equivalent of Nevada’s Burning Man Festival. Called “Cappadox,” events include large scale, sprawling art exhibitions, food fests, full moon and sunrise concerts in hot spots including Uchisar Castle. During July, August and beginning of September, Cappadocia experiences its hottest summer temperatures which can hamper those who like to trek and sightsee. Instead October’s temperatures are ideal for getting about to see main attractions. To beat crowds at tourist spots, visit from October to May, although evening temperatures are chilly during these months and January sees snowfall turning Cappadocia into a winter wonderland. The area experiences hot, dry summers and snowy winters with sparse rainfall, meaning that the best times are spring and autumn before the climate gets too hot or too cold! Many people stay in Goreme, the heart of Cappadocia that is also home to the central bus station and Goreme open-air museum, the top attraction. 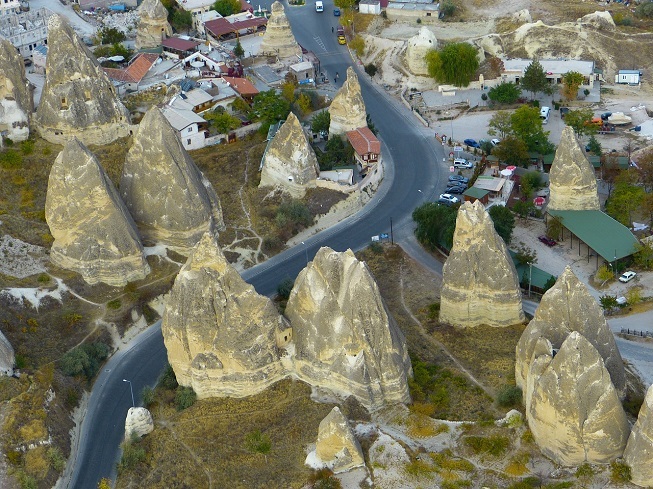 Backpackers like Goreme’s rustic ambience while coach tour groups often prefer Urgup. Choose Uchisar for five-star luxury plus hotels, or Ortahisar for a low key, quieter destination. Cappadocia is accessible from most places in Turkey although some long journeys involve an overnight trip. The easiest way to get there from Istanbul is by plane to Nevsehir or Kayseri airport. It is also possible to fly from Ankara, Izmir and Antalya, though most flights from Ankara are late at night. Flights from Dalaman go via Istanbul. Bus routes are also plentiful from most places in Turkey, including Ankara and Izmir. Many tour companies arrange overnight trips from various coastal resorts including Antalya, Fethiye and Marmaris. If arriving by bus, your destination will be Goreme. Three nights and four days is ample time to visit all the main attractions. They spread out over a considerable distance, so tour agencies in resorts sell Blue, Green and Red tours that visit all places. Group and private tours are available or hire a car to get around at your own pace and to off-the-beaten-track destinations rarely featured in guidebooks. Wherever you stay, book into a cave hotel for an authentic experience. Cappadocia sits on a high plateau, 1000 metres above sea level, and pierced by Erciyes, Melendez and Hasan mountain peaks. Unlike coastal holiday destinations in Turkey, it’s a vast inland area, stretching 400 km east to west and 250 km north to south. Wind and water along with volcanic eruptions of the distant past have left an environment that looks like it belongs to another planet. The ancient volcanoes of Erciyes, Melendez and Hasan erupted about 5 million years ago, leaving sedimentary rocks formed in lakes and streams formed from ignimbrite deposits. The rocks of Cappadocia near Goreme eroded over time to form hundreds of spectacular pillars and minaret-like natural creations. 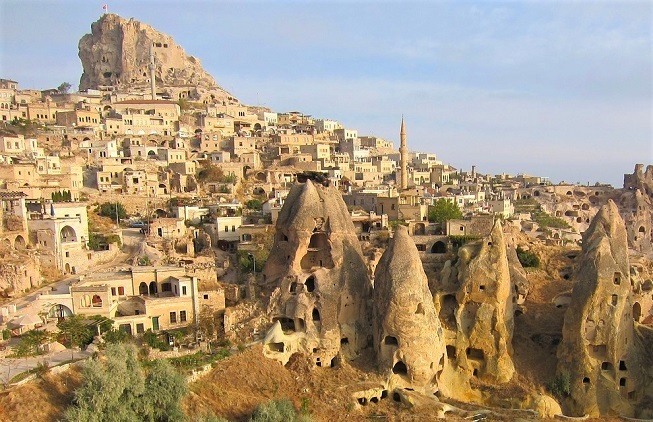 Locals of nearby towns like Urgup, Ihlara Valley, Selime, Uchisar, and Avanos, carved out homes, churches and monasteries from soft rocks of volcanic deposits creating a new settlement that we see today. 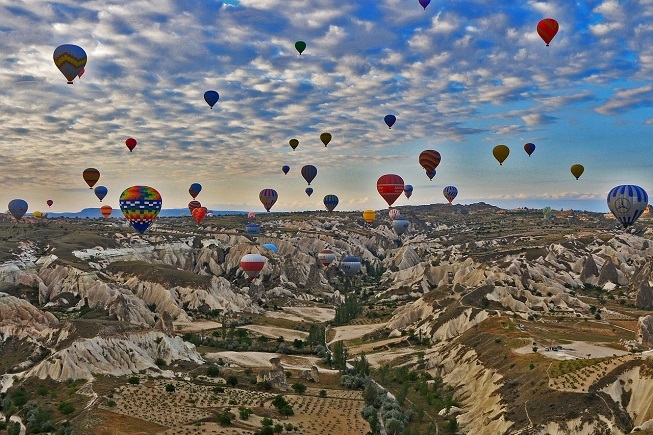 One favourite thing to do in Cappadocia is a sunrise hot-air balloon ride. Half a million tourists viewed the region from above in 2015 making the balloons an iconic regional symbol. Flights take place on at least 300 days of the year, depending on weather and in high season, the sky is littered with them. All set sail to the skies at sunrise, so an overnight trip is essential. Flights leave between 5 to 6 a.m. in peak season to see burnt orange and red lights hit the peaks and valleys as they spread across the landscape. Flights last between one hour and 90 minutes, depending on the package and companies offer a hotel transfer and buffet breakfast with champagne on landing. It is an expensive excursion, but also a once in a lifetime experience! Masses of underground cities play a massive role in captivating tourists. Archaeologists have uncovered over 200 between Kayseri and Nevsehir and are still excavating many. In 2014, yet another underground city was found about Nevsehir, and amazing tunnels and chapels are still being uncovered today. Most recently, archaeologists found a 5th-century underground church with artwork showing scenes of Jesus rising to the sky and other depictions. The best and most extensive is Derinkuyu. To bring our Cappadocia travel tips to an end, we also recommend visiting Goreme Open-Air Museum, a UNESCO site boasting of ancient cave churches and monasteries with restored frescoes. Avanos, a pottery making hub is your chance to take the wheel and craft a pottery masterpiece of your own. If you stay overnight, also buy a ticket to the Turkish night show. Otherwise explore delightful landscapes by trekking, quad biking or horse riding your way around. If you plan to see other places in the country, our article about popular places to visit in Turkey, will be of interest or get to know more about places, food, history and the culture in our Turkey blog.